We would like to believe we know the “why” behind our actions. In fact, if asked, we can provide reasons for every action, purchase, or statement we make. Study after study, however, reveals a different truth: most of the time we don’t know why we do what we do. That is, we’re unconscious to our real motivations. Discovering our real motivations can be a sobering experience because doing so challenges the identity we hold about ourselves. For example, you may think you purchased a sweater because you liked the color or fit. But in reality, you probably bought the item because it reminded you of something: maybe someone you secretly envy (like a celebrity) or someone you subconsciously compete with each day wore a similar sweater. We buy particular brands because they make us feel a certain way and the source or trigger of these feelings are mostly unknown to us. We often deny these primary motivations because they are inconsistent with how we perceive ourselves. This denial makes it difficult to see what forces “below the surface” influence us. Savvy marketers and advertisers, however, understand these hidden motivations and exploit them to get us to purchase their products. Now, what I’d like to do is explore these needs more closely. These needs appear “academic” until we relate them to our daily experiences. Most sources illustrate Maslow’s hierarchy of needs in a triangle (even though Maslow didn’t present it this way). Let’s go through each level of the hierarchy from the bottom up. 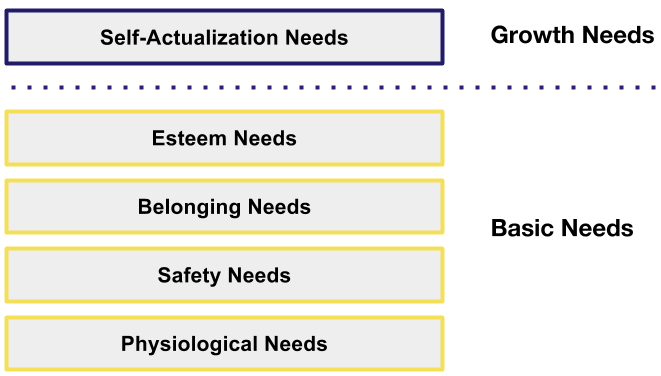 All of the needs below self-actualization are basic needs. 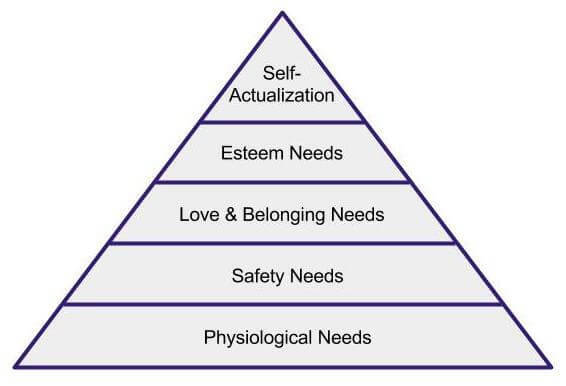 Maslow also called these basic needs neurotic needs or deficient needs because if you’re focused on meeting these needs, you have a lot of fear. You don’t feel yourself. You can’t operate from a calm, quiet center. Any unmet basic need causes problems and tensions that we seek to resolve. Physiological needs are the requirements of all biological creatures. Without air, water, and food, biological organisms perish. When you need food, you eat. If you don’t have food, you get anxious. When you have to urinate during a flight, and there are six people in front of you waiting in line to use the lavatory, your physiological needs are threatened. In some parts of the world, many individuals can’t meet their physiological needs. Over a billion humans don’t have sufficient food to eat or clean water to drink. But physiological needs can remain unmet even in individuals who aren’t in an environment of lack. If as a child, for example, meals were withheld as a form of punishment, a part of you (a child part) might always be seeking food (even when your body isn’t hungry). At its most fundamental level, to meet our safety needs, we need a shelter from the elements, clothes to cover our bodies, and some semblance of the familiar. If you don’t have enough money to pay for rent (or your mortgage), clothes (for protection, not fashion), and transportation (to get food and make money), your safety needs aren’t being met. Here again, many people in the world do not have these basic needs met. And here too, there are psychological components. If a part of you felt physically or psychologically unsafe as a child (which is sadly true for many of us), then that part is continually seeking security. Even as an adult living in your own home, an insecure part can make you feel like something terrible is about to happen. For this reason, many adults leave lights on in their homes after dark or why people keep television, radio, or music running in the background at all times. Also, when you’re in a period of transition, your security needs easily get triggered. Safety implies a certain degree of control. When you’re survival is threatened, you feel out of control. Naturally, you’ll want to get a grip on things. Routines help you do that. But when you’re moving, out of work, or getting a divorce, for example, you may feel unsafe. Belonging is a psychological need predominant in adolescence (called identity crisis), and this need often remains unmet in adulthood. 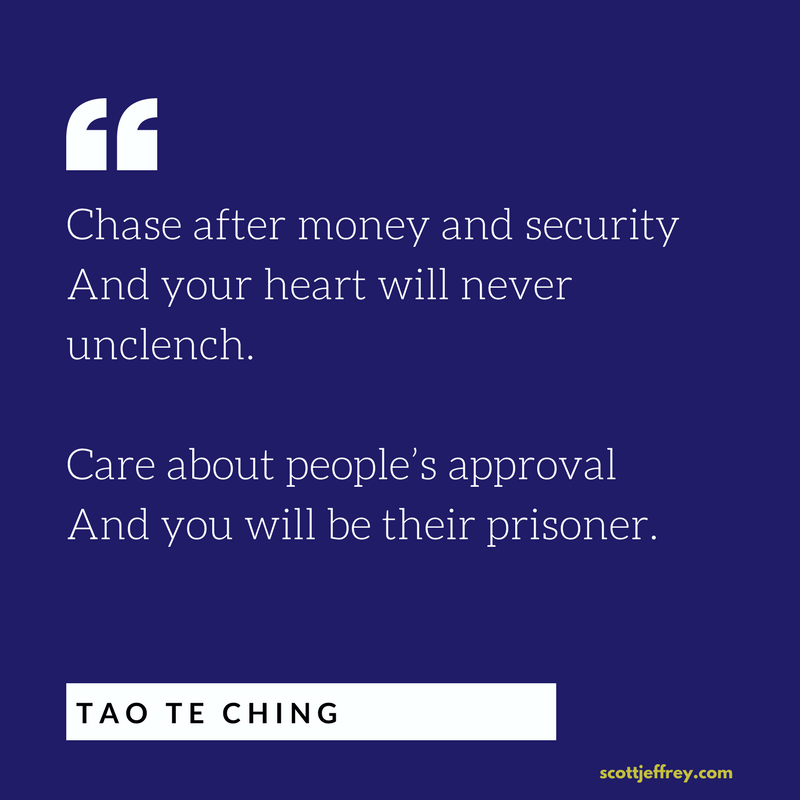 Belonging is a feeling of connection with and approval from others. It starts with our immediate family, then bridges out to religious groups, friends, and other social groups (like sports teams or clubs). And these needs later extend into professional relationships and marriage partners. When you’re born into an unconditionally loving and accepting family and grow up surrounded by mature, mentally healthy adults who can support, guide, and defend you when needed, a feeling of love and belonging can grow in your heart. You become that guiding light for those around you in adulthood and can bless others in need. You also no longer need to be around others to feel okay or complete. But most of us—I day say, virtually all—didn’t have such an experience in childhood (even though we sometimes delude ourselves into believing we did). Our parents may have done the best they can, but they were also immature, unconscious to the majority of their behaviors, thoughts, feelings, and impulses. As a consequence, most of us have a longing to belong that stems from a fear of being alone (which we subconsciously experienced as children). And this unmet need to belong drives us to identify with social groups, religious institutions, and special-interest groups. It also fuels a lot of people’s impulse to invest time in social media. Self-esteem, the last of Maslow’s neurotic needs, dominates most of our behaviors in public. Our image-driven culture pushes us to be more concerned with what other people think than with how we feel. We seek approval from others instead of self-acceptance. This unmet need also stems from being rejected and disapproved of during childhood (in explicit or subconscious ways). Unmet esteem needs influence the majority of Facebook and Instagram usage, for example. Most users are posting things they are doing with a subconscious message of “look how great I am.” And each person is continually comparing and envying each other. Numerous research studies link Facebook usage to increased depression and jealousy. These repressed emotions get triggered because of an unrecognized need for self-esteem. Some individuals have inner parents who are nurturing, accepting, and understanding, who guide their behavior not with shame and guilt, but with self-compassion. These, however, are a small minority. Most of us have harsher inner parents that scold, berate, and judge us. We often call this voice our inner critic, judge, or saboteur. How do you know if you have unmet basic needs? Here’s a simple test: If you can’t just sit down and “be”—if you feel like you need to constantly be “doing something” or consuming something (food, media, drugs, work, etc. )—your basic needs aren’t being met. We all share the same needs. These needs are our birthright as human beings. But when something blocks or challenges these inalienable rights, we begin to exhibit strange behavior. Driven by fear because we don’t feel accepted, loved, respected, etc., we often behave irrationally and impulsively in our attempt to resolve an unmet need. And, generally speaking, the motivation behind our irrational behavior exists outside of our awareness. That is, when something threatens our physiological, safety, social, or esteem needs, we don’t see why we’re behaving as we do. All of these neurotic needs hold us back. They keep us from actualizing our potential and being ourselves. These neurotic needs force us into set patterns of behavior that reflect specific archetypes. When we’re concerned with how people perceive us, we act in a manner we think will meet their approval. Different archetypes have different patterns of behavior. If, for example, you have an unmet esteem needs, you’re going to seek status and approval from other. If someone in your environment is playing the “cool guy” (or cool girl) archetype, you might copy their behaviors and mannerisms to appear “cool” too. Or, if someone behaves like an aristocrat (smug, arrogant, elitist, “high society”) and looks down on you, you’ll react in a specific way if you’re unconscious to this esteem need. You might feel small in comparison to this person, but then you’ll seek out someone else you can dominate to feel better about yourself (in an attempt to raise your internal esteem). Keep in mind that these archetypal patterns of behavior operate outside of our conscious awareness. We might think we are behaving one way, but in fact, we are presenting ourselves in an entirely different manner. Research suggests that over 95% of our behavior is unconsciously motivated. This statistic speaks to the importance of getting to know your shadow. The existence of these archetypes—driven by unmet needs and psychic wounds from childhood—are the causes of this unconscious behavior. “We are born with inalienable emotional needs for love, safety, acceptance, freedom, attention, validation of our feelings, and physical holding. Healthy identity is based on the fulfillment of these needs … These needs are felt and remembered cellularly throughout our lives, though we may not always be intellectually aware of them. They were originally experienced in a survival context of dependency. We may still feel, as adults, that our very survival is based on finding someone to fulfill our basic needs. What set Abraham Maslow apart from other psychologists is that he didn’t want to study neurotic people, which was the exclusive focus of his field at the time. Instead, Maslow set out to understand positive mental health. This task required him to seek out individuals who weren’t struggling to meet their basic needs. Because self-actualizing individuals were focused on their internal growth instead of meeting their external needs, Maslow classified these people as mentally healthy. However, he found it challenging to find enough of these individuals to study. Since Maslow, developmental psychologists have also examined these same individuals. Generally speaking, they represent less than two percent of the population. So what happens once individuals fulfill basic human needs? The individual’s attention makes a 180-degree turn: their attention shifts from what’s outside to what’s inside of them. Will others like/approve of me? How do I compare or size up to other people? Notice how these questions focus on the external world. How can I actualize the best version of myself? Notice how all of these questions relate to the individual. The question of capability or potential isn’t about someone else. When individuals compare themselves to others, external esteem needs, not self-actualization, is motivating their behavior. At first glance, this shift toward oneself appears selfish or egotistical. But it’s just the opposite. Individuals necessarily act selfishly when basic human needs drive them. Why? Because basic needs stem from deficiency, from a feeling of lack, from a fear of not having or being enough. These needs stem from a prevailing sense of separation, and they tend to trigger the fight-or-flight mechanism in our brains. And when this happens, we can’t assess situations from our more advanced prefrontal cortex because the primitive brain center (the limbic system) is in control. Once individuals meet their basic needs, the fears that drive these needs fall away. Individuals can then relax into themselves. The need to impress or get the approval from others doesn’t influence their behavior (even though they’re aware that others judge them). They no longer seek a group or idea to define their identity. Dropping the need to compare themselves to others, they begin to individuate. They now create their own path. Healthy, mature adults no longer hold external rules of right and wrong. Instead, they have their internal moral compass, personal values, and ethics based on what Maslow called B-values, or being values. Being values include truth, wholeness, justice, beauty, aliveness, richness, simplicity, effortlessness, and self-sufficiency. Only such individuals can act selflessly. Otherwise, our actions are mere posturing, driven by some other unmet needs (usually external esteem or wanting to belong in “civilized societies”). This shift of attention from basic needs to growth needs coincides with a shift in an individual’s consciousness. If we strip away all of our unmet basic needs and the drives of the archetypes they represent, we arrive at ourselves: Extraordinary human beings with abilities and capacities beyond our imagination. As Jungian author Robert Moore says, “Being an archetype is easy. Being a human takes work.” In truth, a self-actualizing individual is more human. Humans, in fact, are remarkable creatures with potential we usually only glean from characters in films. Our mission is to strip away everything we’re not. Jung called the process of realizing this unique human individuation. You separate yourself or individuate from the archetypes and behavioral patterns of your culture and society to discover what you are—your Authentic Self. It is in this sacred space that our true humanity lies. It represents an end of fear, an end to unconscious behavior, and an end to needless suffering that we are inflicting on ourselves and others each day. Self-liberation, then, is the goal of psychological work and it’s why “know thyself” was an essential dictum in Ancient Greece. It brings us to personal freedom. It liberates us to our unconscious motivations and habits of the past. And it is everyone’s birthright. The reality is that in daily life, most of us are pursuing all of these human needs simultaneously to varying degrees. Instead of focusing on which need you’re attempting to meet, consider the overall direction of your life. Instead of stacking the needs, one on top of the other, psychologist Clayton Alderfer, illustrated them on a horizontal continuum. If you’re investing an increasing effort on your growth, you probably feel more satisfied. And this satisfaction will likely fuel your growth efforts further. Research by psychologist Martin Seligman confirms this. Seligman, the founder of positive psychology, finds that people feel more gratification (lasting happiness) when they are pursuing growth by playing to their natural strengths. If, however, your emphasis is turning to unmet relatedness and existence needs, your frustration is building. Frustration diminishes your motivation to grow. We are all more alike than we are different. We truly are part of a human family. Most of us are feeling more insecure, unloved, and unworthy than we admit to ourselves or others. And these unmet needs fuel our unconscious behavior. True positive mental health, or mature adulthood, is reached when we resolve these hidden tensions within ourselves. Only then can we access our innate potential as mature adults. Focus on your overall life direction. Are you moving in the direction of growth (and feeling greater satisfaction)? Or are you regressing in an attempt to meet your basic needs and feeling frustration? I know there’s a lot to digest in this guide. Reviewing the descriptions of Maslow’s needs above can help you become more conscious of how they operate in your daily life. And this self-awareness is key to psychological development. The process of self-actualization, of individuation, of realizing our potential is synonymous with the hero’s journey. It’s the developmental path from adolescence to full adulthood, which takes heroic persistence, courage, and will. To accomplish all of this, we must first cultivate self-awareness, become honest with ourselves, and learn to abide in our center. These practices allow us to reflect back and understand ourselves. And as this alchemical process unfolds, we walk forward on the path to our unique destiny. Decoding the Hero Archetype: Friend or Foe?